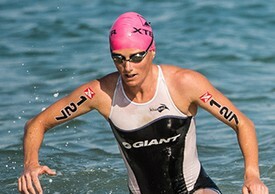 Olympians Nicky Samuels of New Zealand and Flora Duffy of Bermuda confirmed their intent to race at the inaugural XTERRA Asia-Pacific Championship race at Callala Beach in Jervis Bay, New South Wales, Australia next Saturday, April 26. Honolulu, HI – Olympians Nicky Samuels of New Zealand and Flora Duffy of Bermuda confirmed their intent to race at the inaugural XTERRA Asia-Pacific Championship race at Callala Beach in Jervis Bay, New South Wales, Australia next Saturday, April 26. “It’s official, I just entered the 2014 XTERRA Asia Pacific Champs,” said Samuels, the reigning XTERRA World Champion who is a perfect 3-for-3 in her XTERRA career. She won XTERRA Motatapu in March for the second time, and is coming off a strong performance at the ITU WTS opener in Auckland on April 6 where she led off the bike. Duffy, who was third at XTERRA Worlds last year, won the XTERRA South Africa Championship in February and dominated the competition at the XTERRA West Championship at Lake Las Vegas, Nevada on Sunday. “I was keen to race Australia before this race (XTERRA West) but after today’s performance and how I felt, I think I had to book my flight and go to Australia,” said Duffy after Sunday’s race where she posted the fastest swim, bike, and run splits. The pair join an already stellar cast that include this year’s XTERRA Philippines and Guam Champion Renata Bucher of Switzerland, the XTERRA Great Ocean Road Champ Jacqui Slack of Great Britain, and the XTERRA Saipan Champion Carina Wasle of Austria. Combined, those five have won seven of the nine XTERRA World Tour Championship races this season. “A lot of the XTERRA pros are doing several races on the Asia-Pacific Tour so having a big finale race in Australia makes the Tour more attractive and interesting,” said Bucher, winner of 33 XTERRA Championship events in 14 countries including Australia, New Zealand, Malaysia, Saipan, Guam, and the Philippines. Others of note include Lizzie Orchard from New Zealand, who won the 25-29 division XTERRA World Title in 2011, and four-time XTERRA Japan Champion Mieko Carey. Adding to the intrigue are several high-profile local racers including defending IM Australia Champion Rebecca Hoschke, ITU standout Penny Hosken, and rookie elite Dimity-Lee Duke. Showing them the way will be Aussie legend Jody Mielke, who won the first-ever XTERRA Championship race in Asia at the 2000 Japan Championship. The XTERRA Asia-Pacific Championship is the marquee event on XTERRA Asia-Pacific Tour that includes races in New Zealand, Philippines, Australia, Saipan, Guam, and Malaysia. Headlining the men’s race is Conrad “the Caveman” Stoltz – a 7x World Champion who has won an unprecedented four XTERRA World Championship titles and three straight ITU Cross Tri World titles, and just won the XTERRA New Zealand Championship race in Rotorua on April 12. Stoltz’ home country will be well represented as fellow South African star Dan Hugo and young-gun Bradley Weiss are on the start list as well. Weiss is also hot, fresh-off a career-best runner-up performance at the XTERRA West Championship where he finished runner-up to American star Josiah Middaugh. The Aussies will be in full force as well with North Wollongong’s own Ben Allen, who won an unprecedented seven XTERRA World Tour races last year and this year won the XTERRA Great Ocean Road off-road tri in Anglesea and the XTERRA Saipan Championship in the Northern Marianas on back-to-back weekends before finishing second to Stoltz at XTERRA New Zealand on Saturday. Other high-profile Australian racers include two-time Olympian Courtney Atkinson, who won XTERRA Great Ocean Road last year, Dr. Mitch Anderson – a former Ironman Champion, Alex Reithmeier who just finished third at the Australian Cross Tri Championships, and Todd Israel. Also of note, Craig Evans from the U.S., a 12-year veteran of the sport who was 2nd at ITU Cross Tri Worlds in ’02, Kiwi Braden Currie – the two-time winner of XTERRA Motatapu who finished 5th at XTERRA Worlds last year, Olly Shaw – the 20-24 XTERRA World Champ in 2012 before turning pro, Brice Daubord from France, who finished in the top 10 at XTERRA Worlds last year, Roger Serrano from Spain who was recently the runner-up at XTERRA Great Ocean Road in Australia, and XTERRA Philippines two-time national champ Joe Miller. TEAM Unlimited LLC, owners and producers of the XTERRA World Tour, has a three-year strategic partnership agreement with Destination New South Wales to host the XTERRA Asia-Pacific Championship off-road triathlon and accompanying sports festival in the Jervis Bay area. The inaugural event will double as the XTERRA Australia Championship. The weekend will also include a sprint distance off-road triathlon, trail runs, kids events, clinics, and social gatherings. As the most prestigious event in XTERRA’s Asia-Pacific series that includes championship races in Australia, New Zealand, Malaysia, the Philippines, Japan, Guam, and the Northern Marianas – the XTERRA Asia-Pacific Championship will offer $50,000 in prize money to the sport’s top professional athletes and two television shows will be produced for international distribution. The XTERRA Asia-Pacific Championship is proudly supported by the NSW Government through its tourism and major events agency, Destination NSW. Presenting sponsors include John Paul Mitchell Systems, the world’s largest privately owned professional salon hair care company, Outrigger Hotels & Resorts – one of the largest and fastest growing privately-held leisure lodging, retail and hospitality companies in the Asia-Pacific and Oceania regions, Flight Centre Active Travel (the official Travel Partner) and XTERRA Wetsuits & Boards Australia – the official swim sponsor. TEAM Unlimited is a Hawaii-based television events and marketing company, founded in 1988. It owns and produces XTERRA and in 2013 will offer more than 300 XTERRA off-road triathlon and trail running races in 18 countries worldwide. In addition, TEAM TV has produced more than 300 adventure television shows resulting in three Emmy’s and 42 Telly Awards for production excellence since 1990. View samples at www.xterra.tv, and learn more at www.xterraplanet.com and www.xterratrailrun.com.